Apple’s leadership as an innovation force in technology remains uncontested. Their devices are known for their quality, gorgeous design and advanced features. Everything that Apple does gets into the spotlight and revolutionizes the industry. Even though Android is a strong platform in the smartphones and tablets market, Apple’s iPhone and iPad have achieved an iconic status and are regarded by many as the top mobile devices. 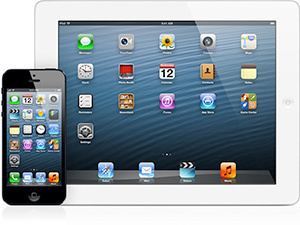 Apple broke iPhone and iPad sales records at the end of Q1 2014, and continues to dominate the sector. Update 31/01/2016: If you have upgraded to iPhone 6, visit our VPN list here. In order to enjoy all the fantastic features and remarkable apps available from the App Store, users of iOS devices need to ensure that their internet connection is secure. This does not only mean that they have to make sure that they will be safe from malware. There are other risks such as having your personal conversations or browsing history tracked. Protecting your privacy online and your identity is crucial whenever you connect to internet but it is particularly important when you are using your mobile device to connect to public Wi-Fi. Malicious hackers, corporations and the government could be monitoring your online browsing, your emails and conversations. Think about all the information that you send and receive online and how much it means to you that it remains private. For instance, if your business’ confidential information falls in the wrong hands, you may incur in losses. If your competitors get access to your on going projects, your company would be seriously affected. Even if you do not have a business, it is essential that you ensure that your information remains private. Otherwise, your financial details could be compromised or your privacy could be breached. VPN services are a must-have for anyone that wishes to guarantee that their personal information is secure online and that their identity remains safe. In order to find the best VPN services for iOS, we looked at different aspects, including speed, servers, value for money and customer support. Here are the VPNs that offer the most secure and effective service for your iPhone or iPad. With PureVPN you can enjoy peace of mind as you surf online, chat with your friends or download files. Your data will be secured and you will have the possibility to enjoy content from your favourite websites, regardless of your location. The setting up process is simple and thanks to their detailed guides, you can do it without any inconvenience. Their customer support is recognized for their effectiveness and rapid response. They also have great features that will suit users with advanced requirements. ExpressVPN stands as a strong VPN provider that offers a solid selection of features and an excellent iOS support. There are many advantages of using ExpressVPN such as speed of the service, along with a large network of servers that allow you to appear as if you were connecting from different locations across the world. You can configure the iOS client easily and use OpenVPN to ensure the security of you data. You can protect your online traffic with their powerful 256-bit encryption to make sure that everything you send and receive is always secure. Private Internet Access gives you the possibility of accessing three devices form the same account so you can keep your information protected whether you are login from your Mac, iPhone or iPad. The speed of the service offered by Private Internet Access is impressive so you can get a high level of security without affecting your connection, making it an ideal VPN for streaming media content. While setting up the iOS client is not as easy as it could be, it is still a great option to enjoy internet in your mobile devices. The iOS client offered by ibVPN is exceptional and they provide step-by-step instructions to complete the set up. Security is one of the strongest point of their service, thanks to great settings that ensure that your connection remains protected against eavesdroppers. Their customer service is another aspect to highlight as they offer skilled service that can really solve any issues you may come across. However, when it comes to speed, ibVPN disappoints and even though they have a no logging policy, they do seem to track of certain information but there is no clarity about what they exactly keep and for how long. Still, their service is easy to install and to use.